Golf swing power is determined by what happens at impact. And if you want to hit solid, accurate and long golf shots then you absolutely must have the correct wrist position at impact. And the correct impact position is for your left wrist to be flat and your right wrist to be bent (for a right hander). Sadly a lot of golfers have the reverse of this happening at impact which creates very short shots, and no matter which golf club the golfer uses the ball still tends to only go the same distance. So I’m going to give you a really good drill to help you get into a great impact position with your wrists. The first thing I want you to practice is something called power chipping. To do this I want you to setup to a chip shot as you normally would and then take the club away without breaking your wrists. Only swing the club back a couple of feet and then when you swing the club back to the ball I want you to make sure your left wrist is flat at impact and your right wrist is bent. At the finish of your chipping swing stop and check that this happened. If it didn’t then keep practicing this chipping swing until you can do that consistently. That is critical. When you’re doing this you don’t need to worry about the results of your chip shots. You’re just supposed to be concerned with the action of your wrists through impact. After you have got this mastered with your chipping golf swing then I want you to move up to doing longer swings, while still making sure that at impact your left wrist is flat and your right wrist is bent. I suggest you start with a golf swing where your left arm is parallel with the ground on your backswing. 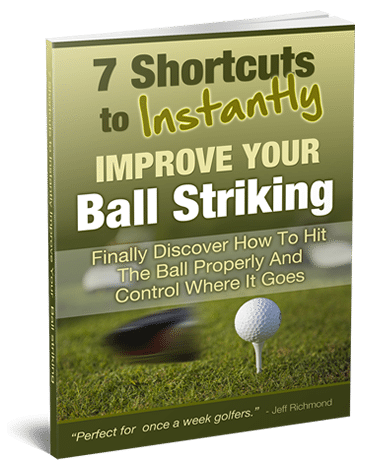 But when you do these longer practice golf swings make sure you abbreviate your follow-through so you can check your impact position easily. 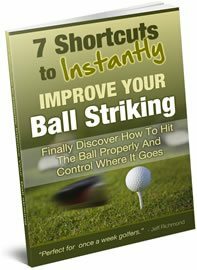 This golf swing drill is critical if you want to hit powerful golf shots with a penetrating ball flight. Because if you contact the ball with a left wrist that is bent, like a lot of golfers do, then you’re going to hit weak, short golf shots. Picture a boxer punching with a bent wrist. If they did that they would break their wrists. Although with golf you won’t break your wrists hitting the ball with a bent left wrist, you will never hit the golf ball as far as you possibly can. Also, a lot of your irons will go the same distance, as I’ve already said. In other words, you can never reach your full golfing potential if your left wrist is bent at impact. So please don’t take this information for granted and do the golf swing drill I have suggested to work on your left wrist position at impact. All the best ball strikers hit the ball with a left wrist that is flat. So be sure to practice this and reap the rewards of longer, more accurate golf shots by doing this golf swing drill.